Fireworks sparkled in the night sky over Michigan City, Ind. as drum corps performed on Ames Field Saturday, July 3. It was the 50th anniversary of drum corps in Michigan City, with the Pageant of Drums DCI Tour event celebrating a momentous milestone. Fans enjoyed riveting performances from nine World and Open Class corps, including exhibitions and encores from the Classic Cavaliers, the Toronto Optimists, and the National Anthem played by the Michigan City High School Marching Wolfpack. 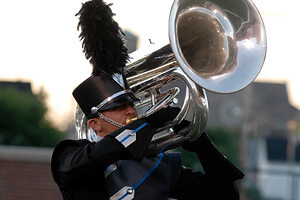 Attending fans saw significant improvement from all the corps this night as the 2010 summer season advances into July. The Cadets (84.900) took the top spot, performing "Toy Souldier" in their first-ever appearance at the Pageant of Drums. Drum Major Ben Pouncey said the energy level from his fellow corps members was noticeably higher during the last few days. "The end has really gained a lot of momentum for us," Pouncey said. "It's been a work in progress over the last couple of weeks and it's really starting to come around." And though this year's corps is younger than in years past, Pouncey says the group hasn't lowered its expectations. "We have a lot of new people in the corps this year, but I think the new people are really starting to step up," said Pouncey. Our goal for this season is to be the best Cadets drum corps that there has been up to this point. We do that by getting up every morning and working as hard as possible so that we can be on that field [World Championship] Finals night saying we did everything we could to put that perfect performance together." In second place was the Cavaliers (83.000), improving by more than two points from the corps' previous performance. The ensemble seemed a bit "madder" than usual, with audience members reacting with surprise, laughter and awe to their performance of "Mad World." But perhaps the most exciting moment for many was watching the corps in an encore performance alongside the Classic Cavaliers, comprised of members from previous Cavaliers generations. The Glassmen (77.400) took third place with their 2010 production "A Prayer Cycle." Following not far behind were the Madison Scouts (4th, 75.700), who had the crowd cheering for "Slaughter on 10th Avenue" and "Rhapsody in Blue." In fifth place last night, the Colts (72.700) did not disappoint; their production, "True Colors," was a high-energy performance that drew big moments of applause. Taking sixth place was Teal Sound (69.600), performing "In the Presence of Enemies" in the corps' first year in the World Class. Three Open Class corps performed as the sun began to set, shining blindingly across the field. The Blue Saints (3rd, 40.900) took the field first in competition, performing their 2010 show "The Struggle Within." Last night's performance was the corps' first this season. The second competing corps was the Colt Cadets (1st, 67.100) in what horn line member Betsy Guthrie called "the best show of the year." "It's one [of those productions] that gives you goose bumps," Guthrie said. "I like how it's original and not really themed the way other corps do things. It's the fight between good and evil." In her third year marching in a drum corps, Guthrie said she's still learning a lot about not only performing, but teamwork, bonding with other members, and learning how to rise above tough situations. The third Open Class corps to perform was Legends (2nd, 65.500), performing its production "Ruins." The Michigan City event was the first show of the year for the Michigan corps, which came out of the gate with many new members ready to make their mark in competition. "We've been working very hard on building our show and welcoming the new members to make a new drum corps for this season," said drum major Kelly Koch. "[They're] mostly high school and college students who just really love music and want to be a part of what we're doing." This is Koch's fourth year, and like many others, she feels a new, stronger energy coming from the corps. "This season I feel a whole new level of 'umph!'" she said, looking for the right word to describe the members' attitudes. "They want it more, I think, than in any other season Legends has had. We're dialing in a lot of our rehearsal procedures and the little details that make us who we are." Ames Field in Michigan City will also be the site of Open Class World Championship Quarterfinals on Tuesday, Aug. 10. Many Open Class corps, from 7th Regiment to Velvet Knights, will go head-to-head, with the top 17 ensembles advancing to the Semifinals and the top 12 to the Finals, at Lucas Oil Stadium in Indianapolis, Ind. The complete performances of all corps that competed in Michigan City are now available for on demand playback on the DCI Fan Network. Video on demand is available exclusively to Fan Network subscribers with several year-long subscription options starting at just $39. View a complete recap of scores from Michigan City, Ind. Watch Michigan City performances on the DCI Fan Network. Learn more about the Open Class World Championship Quarterfinals. With assistance from Ryan Cain, Amy Fallon.